Geneviève Lalanne was born in Orthez, in the French Pyrenees, in 1922. She earned a baccalaureate degree in English from the University of Bordeaux and during the war, studied in Paris. She was one of the first women to graduate from the Ecole des Sciences Politiques in Paris. 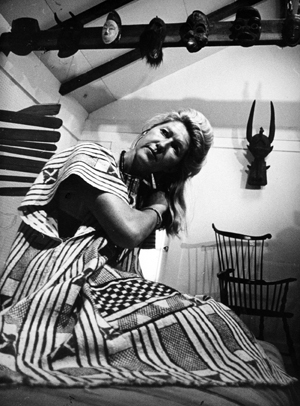 During her years in Paris, Ginou (as she was known to her friends) met and became influenced by Madeleine Roussau, a renowned collector of African and Oceanic Art. Rousseau sparked a life-long passion in African and Oceanic art and material culture, encouraging the young collector, who over her lifetime would amass over 1500 objects that were housed in her apartment in Cambridge. In 1944, following the liberation of Paris, Ginou met Robert McMillan, an architect who was an officer in the US Army. Within two years they had married and settled in Massachusetts. The marriage didn’t last and Ginou moved to Harvard Square, where she became an important figure in the culture and development of the neighborhood. In 1950, she opened Henri IV, the first French restaurant in Cambridge, bringing the chef from the Pyrenees. The restaurant became a local favorite and was frequented by artists, writers, academics and filmmakers, including Juan Miro, William Faulkner, Thornton Wilder, Alexander Calder and more. Downstairs, she opened Club Nicole, a night spot featuring world music that became a gathering place for international students and academics. During the summers, she would close her restaurant and travel throughout the world. Over the following years she acquired other properties around Harvard Square, which helped her expand her collection and support an extraordinary range of causes in the arts, civil and human rights and equal justice. It was during the years at Henri IV that Ginou met her friend, the painter Reba Stewart. When Reba died early after a trip to Africa that Ginou had helped support, Ginou worked over the years to ensure the distribution of Reba Stewart’s works and to ensure her legacy. Geneviève McMillan’s collection is featured in Material Journeys: Collecting African and Oceanic Art, 1945-2000 (MFA Publications) and parts of her collection are now housed in museums and colleges around the country, including the Museum of Fine Arts, Boston, The Baltimore Museum of Art, the Reginald Lewis African American Museum, the Fitchburg Museum, Tougaloo College, Roxbury Community College and others.